Rammellzee, Color Letter Racer Set (c.1988) and White Letter Racer Set (c.1991). 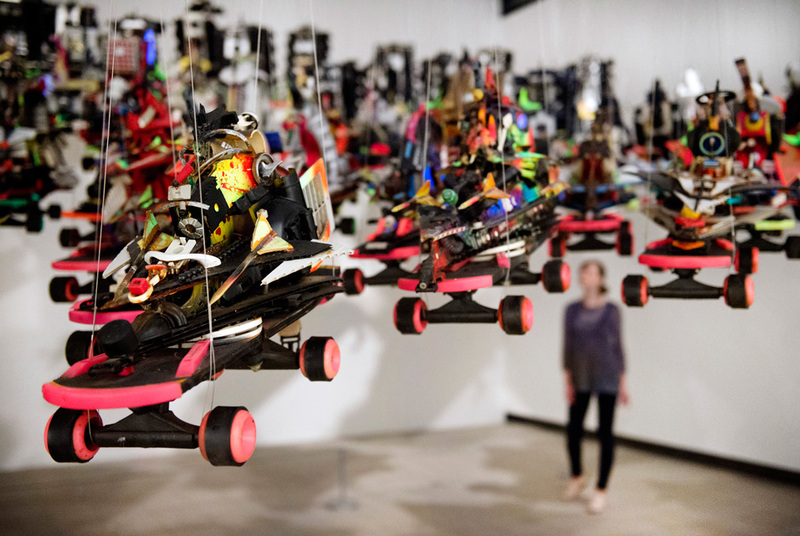 Hayward Gallery Alternative Guide to the Universe exhibition installation view, 2013© Estate of Carmela Zagari Rammellzee. Courtesy The Suzanne Geiss Company. Photo: Linda Nylind. LONDON.- Alternative Guide to the Universe summons mavericks, visionaries and outsiders to create a bracingly unorthodox perspective on the world we live in. This major Hayward summer show is a guide to an artistic landscape that stretches to the far horizons of imaginative experience. A collection of inventive and beautiful pieces, Alternative Guide to the Universe is a rare opportunity to discover works from self-taught artists and architects, fringe physicists, dreamers and visionary engineers, all of whom seek to reinvent the world we live in. Alternative Guide to the Universe is part of Southbank Centres Festival of Neighbourhood with MasterCard. Alternative Guide to the Universe focuses on individuals who develop their ideas and practices outside of official institutions and established disciplines. Eccentric and inspiring, their work ingeniously departs from accepted ways of thinking in order to re-imagine the rules of culture and science. Spanning a wide range of forms and materials, it includes epic paintings of alternative calendars as well as obsessively detailed drawings of the human nervous system; scientific charts and fantastical engineering plans; functioning robots and blueprints for cities of the future and the evolution of human consciousness. Several photographers in the exhibition, meanwhile, explore fictional identities and alter egos, including a homeless artist from Chicago whose theatrical photo-booth self-portraits anticipated the work of Cindy Sherman. Taken together, the speculative visions in Alternative Guide to the Universe rival the wildest inventions of science fiction - with the difference that these artists actually believe in the validity and veracity of all that they describe and propose. Whether speculating on mysteries of time and space or charting the unseen energy flows of our bodies and minds, their imaginative creations invite the viewer into a universe where ingenuity trumps received wisdom. "These brilliant mavericks expand the spaces in which our own imaginative thinking about the world may venture," says Hayward Gallery Director Ralph Rugoff. "However farfetched or outlandish it may seem, their work possesses an intensity and bracing originality that gives it a compelling reality all its own. It invites us to think outside of our conventional categories and ultimately to question our definitions of normal art and science." Collectively, the creative practitioners at the Hayward Gallery effortlessly cross the boundaries of art, science, fiction, reason and mysticism. Their work opens up an extensive visionary space, pictured in the chimerical towers of Marcel Storrs delicately intricate drawings (which he believed would provide a blueprint for re-building Paris after a nuclear attack), or measured in the gorgeous cosmological diagrams and numerical calculations of Alfred Jensen. While the contributors to Alternative Guide to the Universe are all engaged with aesthetic issues, their work is motivated by far-ranging concerns. Underground street artist Rammellzee fashioned his Letter Racers as part of a campaign to liberate the alphabet from the strictures of Western civilization. Numerical savant George Widener embeds complex mathematical puzzles in his drawings in order to address a future audience of intelligent machines. Likewise Guo Fengyi considered her eerily graceful drawings to be "painted prescriptions" that had unique restorative powers. Paul Laffoley's visionary art outlines his alternative theories of consciousness while Karl Hans Janke sought out ways of producing unlimited energy. Highlighting the virtues and values of these wayward theories will take visitors on a journey to the far side of the human imagination. Celebrating the irrepressible urge to reinvent reality, Alternative Guide to the Universe will be complemented by a display of The Museum of Everything in the Hayward Project Space. The Museum of Everything presents an installation of sculptures, photographs and films dedicated to visionary builder and sculptor Nek Chand, who has spent over fifty years creating his legendary "Rock Garden" outside Chandigarh, India, a 20 acre magical kingdom fashioned from scrap materials. Alternative Guide to the Universe includes work by Morton Bartlett, Emery Blagdon, James Carter, Guo Fengyi, Lee Godie, Richard Greaves, Alfred Jensen, Bodys Isek Kingelez, Paul Laffoley, Jean Perdrizet, Rammellzee, A.G. Rizzoli, William Scott, Marcel Storr, Eugene von Bruenchenhein, Melvin Way, George Widener, Wu Yulu, and others. Alternative Guide to the Universe is curated by Ralph Rugoff, Director, Hayward Gallery.